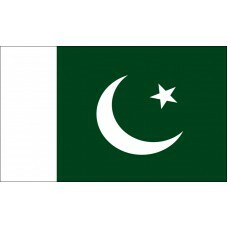 The Pakistan Flag consists of a green field with a white crescent moon and a five-pointed star in the middle of it. 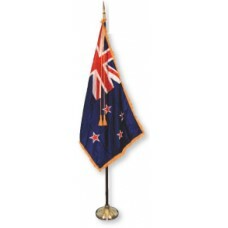 On the left side of the flag, is a vertical white band that meets the edges. The green color represents Islam and is thought to be the favorite color of the Prophet Muhammed and the white color represents the religious minorities. The crescent and the star represent the progress and the light and knowledge. The Pakistan flag was adopted on August 11th, 1947, which was four days before their independence was declared and it was designed by Amiruddin Kidwai. 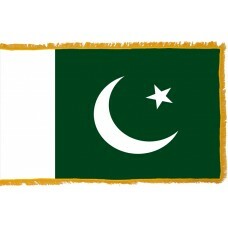 The Pakistan flag, as a whole, is symbolic of Pakistan's devotion and commitment to Islam. Pakistan (which is officially known as "Islamic Republic of Pakistan") literally translates as "land of the pure." It is a country in Southern Asia that shares borders with Afghanistan, China, India, and Iran and the capital city is called Islamabad. The largest city in Pakistan is called Karachi (which also used to be the capital) and is home to approximately 13,000,000 people. Throughout history, Pakistan has been home to many empires and civilizations, and it is thought that one of the oldest civilizations in the world was in Ancient Pakistan 9000 years ago – the Indus Valley Civilization. During the 16th – 17th centuries, the Mogul Empire ruled the majority of South Asia, but in the 18th century, the British came to the area and dominated the area of Pakistan and part of India. In the 19th century, India was mainly ruled by the East India Company which was a British trading organization, and in 1857, the Indian army started a battle which was known as the "Indian Rebellion of 1857," opposing the East India Company. 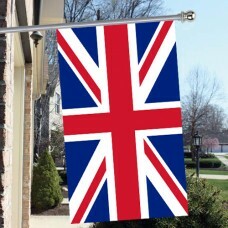 During the battle, the British parliament became involved, and as a result, India were defeated, and the British Parliament took over and ruled the country. In 1858, the British Raj was established and ruled for almost 100 years. In WWII, the Indian army fought with the British army on the condition that Britain would grant them independence. India was granted independence, and, at the same time, due to all the religious conflicts between the Hindus and the Muslims, India was divided into two separate countries: Pakistan (for the Muslim majority) and India (for the Hindu majority). There were two ceremonies to celebrate the independence – Pakistan's was celebrated on August 14th, 1947 and India's was celebrated on August 15th, 1947. Independence was declared at midnight by the Prime Minister at the time, Jawaharlal Nehru, who stated "At the stroke of the midnight hour, when the world sleeps, India will awake to life and freedom. A moment comes, which comes but rarely in history, when we step out from the old to the new, when an age ends, and when the soul of a nation, long suppressed, finds utterance."